“We did it and never looked back. Lots of ice and stays COLD!! This Samsung has a lot more room and did I say it stays COLD!” says iRV2 Forums member Mark Miller shares about his 2008 Damon Tuscany motorhome’s unit. Residential RV refrigerator of Mark Miller, iRV2 member. Another RVer on Facebook agrees. “Love my residential. Same footprint as the rv one, way more room. New residential fridge, inverter and 400 watt solar system to run it when boondocking was cheaper than a Rv fridge,” explains Dan Aldridge. In fact, scan any iRV2 Discussion Forum topics about Residential Refrigerators in RVs and you’ll likely discover that the vast majority of RVers who have opted out of traditional gas absorption style refrigerators say that it was a good idea to do so. 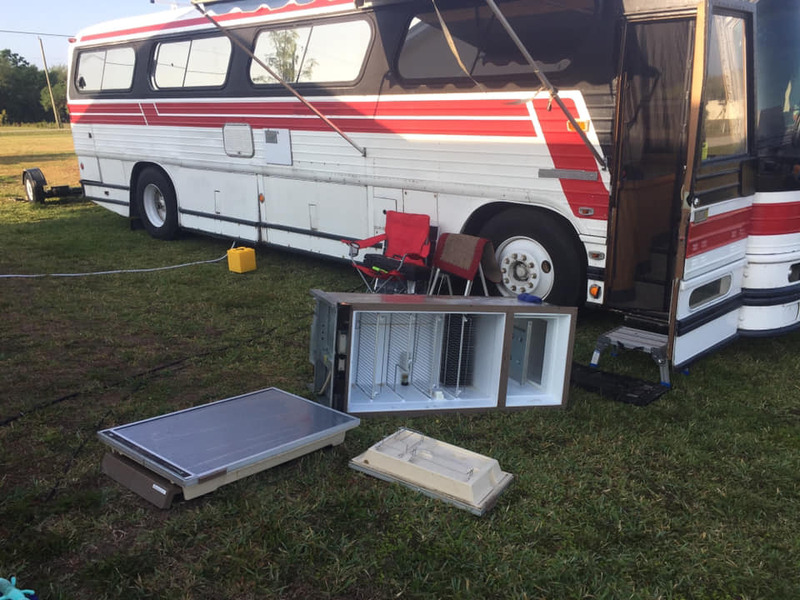 They agree that although traditional RV gas absorption refrigerators can be powered three ways – by liquid propane, 120V conventional power and sometimes 12V power produced by the RV’s batteries – the downsides of owning a unit outweighs the positives. RV interior modifications are often necessary for the unit to fit. Is a Residential RV Refrigerator Good for Boondocking? The power consumption of a gas absorption-style refrigerator versus a residential RV refrigerator are so similar that most RVers say they don’t notice the difference. But because residential RV refrigerators can only be powered by conventional electricity, many people are under the impression that boondocking is not an option when you install one of these units. That couldn’t be further from the truth. If you enjoy dry camping, don’t dismiss owning one of these units as an option. Talk to other hard-core RV boondockers with residential RV refrigerators to get the real story. “We dry camp often. Have residential refrigerator. Don’t find it to be a problem. With our coach the RR option included six rather than the standard four batteries,” explains vsheetz, an iRV2 Forums member. “We also dry camp a lot and have upsized from Group 24 to CG2 golf cart batteries – 4 total. The refrigerator will consume about 25% of the battery capacity in a 24 hour period absent any charging,” says 2Escapees iRV2 Forums members. 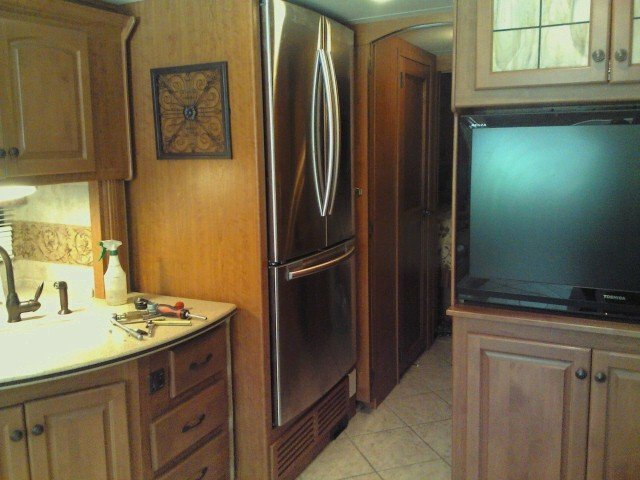 If you keep your RV long enough, your refrigerator will need replacing. 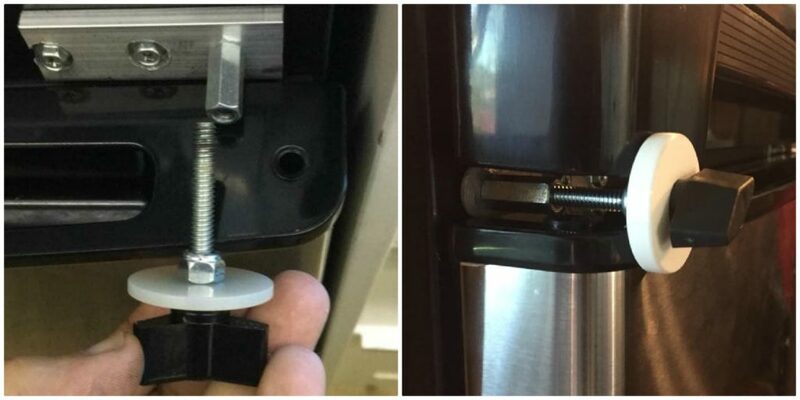 If you’re thinking of buying a residential RV refrigerator, rest assured that for most RV owners, installing one of these units was the best thing they ever did to enhance their RV travel experience. I’ve changed to 230 V AC fridges in all my DIY conversions. Many people here in Europe have done so, over the last decades. In combination with some solar panels and a big enough household battery it gives me a lot more autarky. Domestic fridges (typical energy class A+++) have a much higher return on energy than the DC variety, even when we take the loss in the inverter (5-10%) into consideration. Something to thank the energy freaks and politicians for. BTW Because the inverter is on anyway, I have installed most appliances, like water pump, TV and lighting also on AC. Easier to purchase and a lot cheaper than dedicated motorhome products. I took it for granted, but maybe it’s not…. The main difference in fridges is of course the working principle: compression v. absorption. I think it great to always finding ways to improve your RV (Home). I have always remembered when moving a residential refrigerator prior to use you were supposed to them settle , something about the freon in the cooling system. I guess they redesigned residential type refrigerators if they seem to be working while on the road. Personally seeing how it is just the wife and i,we don’t need a massive big refrigerator. The RV style fridge that came with our RV is big enough. Plus for us to convert properly it would have an initial cost upward of $10,000.00. Do to not having any solar at this time. So yes I can see how this could be a good upgrade, it should be mentioned that for anyone without solar it could get very expensive very fast. If the residential refrigerator puts a drain on your batteries of 25% in a 24 hour period and you should never drain your batteries more than 50% ( led acid ) that really doesn’t leave mush power for much of anything else does it? With such a large draw on the batteries doesn’t that create more cycling which in turn lessens the lifespan of your batteries? Depending on what type of batteries you have that could be an expensive maintenance cost And how does that solar do during cloudy days or shady areas (like forest areas)? Hmmm, I think prior to any major purchase you should do your homework thoroughly. In this case it’s not only replacing a refrigerator but it’s the entire package in order to operate it off grid like an traditional RV refrigerator. So pros & cons? You can probably add this to the cons list of the residential refrigerator. Of course everyone should do as he/she likes. But you are you painting a very unfavorable picture. Where do the $ 10 000 come from? Cable and glue from the junk box. A day and a half of craft work. The 12 V 230 Ah household battery ($ 365.40) and the 1000 W pure sine inverter ($ 148.45) I bought about a year before, so I re-used them. The fridge draws about 50 W (measurement), with a duty cycle of about 50 % (depending on the outside temperature). The apparent overcapacity of the inverter is because of the starting current of the fridge, for which I usually calculate a minimum of 10 times the nominal current.. Being parked with a full battery, without hook-up, without generator, without engine running and without sun, we can stay 48 h (which we hardly ever do). In practice the fridge/freezer is on all summer, without the battery ever being discharged more than 35 %. We run our 10 cuft residential fridge on 4 12v Interstate batteries that offer about 160 usable amp hours and 300 watts of solar. We rarely take our batteries down below 60-70% and we don’t run our generator any longer than most folks ( 1-3 hours a day). With our battery monitor installed now, we can get better idea of our exact power usage when boondocking this winter and may not need to run our generator at all on sunny days. We do turn our fridge inverter off at night, however. Residential units are so well insulated we rarely gain more than 3-4 degrees in temperature overnight. We see no reason to ever go back to an RV fridge. “No Thanks” to a Residential Refridgerator (RR) in my RV. You’ll need to install an expensive inverter and more batteries (Most RVs have 1 or 2, you’ll need 4 to 6 batteries fr boondocking). You will go through batteries much faster. In contrast, a propane RV Fridge runs a long time on propane and uses very little battery power. An RR can be very tough to install in an RV (will it fit through the door?). RR’s are not built to take the constant vibration of the road, and most repair companies and technicians will NOT work on them unless you remove it from the RV first. Dave got the most important part right, will it fit thru the door!! And with batteries now running 100 bucks each, I think I will stick with my LP. Burned thru a whopping $30 in propane last year and never had a problem with my 15 year old RV Fridge. Take a look at long line fish boats that stay out for weeks at a time. They run commercial 110 volt house style fridges. They definitely bounce around and keep on running. Propane Powered refrigeration seems to last forever. Since we boondock very often it is the simplest way to go. We are campers and do not live full time plugged into electric in an RV Park. Buy what works for your life style. Our life style is getting out in nature not an RV Park packed with monster motor homes and 5th wheels. I have a small RV and sleep near the refrigerator. My concern is the noise of the compressor motor turning on and off in a residential fridge. What about the more continuously running inverter motor? Is it quiet enough? Most modern compressor fridges are hardly audible. Still, there may be a click the moment the compressor comes in. The inverter is all solid state and the only moving parts are the cooling fans which only are moving when the electronics are getting hot. With a 1000 W inverter and a 50 W fridge and some smaller gadgets (a MacBook, some LED-lamps, a flatscreen TV) the electronics never get that hot. Actually, the TV draws more than the fridge, but the fridge is on 24/24. NB My voltage is 230 C. The same power at 120 V will draw twice the current. I’m an engineer with experience in both refrigeration (data center AC) and RV’s (Safari Motor Coaches). I’d like to dispell some myths; 1) (Wikipedia but factually correct), “In the early years of the twentieth century, the vapor absorption cycle using water-ammonia systems was popular and widely used, but after the development of the vapor compression cycle it lost much of its importance because of its low coefficient of performance (about one fifth of that of the vapor compression cycle).” Propane is simply a far cheaper and more direct heat source, not more efficient. 2) Issues of vibration damaging residential air conditioning equipment are present but easily avoided. Most residential equipment has tubing associated with the compressor that is not adequately supported to prevent metal fatigue when subject to excessive road vibration. My position is that most RV’s don’t travel far enough or across roads rough enough to cause much significant ‘injury’. If you do or plan to, buy a can of spray foam and foam around piping OTHER THAN THE CONDENSER GRID, to limit its movement. This will also help thermal efficiency. On the condenser, secure it with additional metal brackets, especially if its horizontal. Most refrigerator condensers are vertical and require little, if any reinforcement. Most of this myth has a basis in truth that came came from using residential window AC units which are cheaply built and succumbed to metal fatigue from poor (for a moving vehicle use) pipe support. I put about 8000-10000 miles on mine a year. Except that year I drove to Alaska, about 17000 miles. You think a RR will hold up? My 2015 Dynamax DX3-37RB (bought new in May, 2014) has a Frigidaire Professional Series 22 cubic foot residential refrigerator as standard OEM (an RV fridge was an expensive option). After two years of winterizing said RR using RV antifreeze (as well as compressed air), the fridge water lines sprung tiny pinhole leaks. A Dynamax employee told me that the water lines (for chilled water and ice) deteriorate when RV antifreeze is used when winterizing. I had BEGGED Dynamax for instructions re: winterizing residential appliances but, Dynamax always replied that the information I needed was available online (the documentation included with my DX3 was ABYSMAL). I could NEVER find information regarding winterizing a RR (or ANY residential appliances) on the Dynamax website; ONLY winterizing NON-residential appliances. Good luck in finding the EXACT replacement hoses needed to effect repairs (and that happens ONLY after the fridge is pulled out of its’ cubbyhole). Of course, a large RR will NOT fit through the RV door. Window(s) will have to be removed to muscle the old RR out and, get a replacement in (more poor planning and design on the part of the RV builder). Dynamax also installed ONLY TWO 12VDC house batteries to power said large RR. Those to 12VDC batteries would be dead in ~ 12 hours (starting from a fully charged state) By my second trip, I upgraded to SIX 6VDC batteries quadrupling my amp hour capacity. I can now go 48+ hours on that battery upgrade. Other than these two issues, I am VERY happy to have a RR and, would NOT consider “downgrading” to an RV fridge. In custom RVs, I’ve seen MUCH better implementation of residential appliances. Dynamax (and other high-end RV builders really need to “up their game”. our doors stayed closed for the 7000 miles we traveled this summer. Alabi #1; When moving a compressor refrigerator, it is important to let it sit for a ‘while’ before operating it ONLY IF you laid it on its side or tilted it to the near equivalent. This is an issue of compressor oil, not refrigerant. The oil circulates in the system when it is running and returns to the compressor through gravity when it shuts off. If laid on its side, the oil can pool in places other than the compressor so if you start it up shortly afterward, there is no oil in the compressor to keep it lubricated and it can be damaged. It is rare but it can happen. How long should you wait? Its really hard to tell but 1/2-1 hour is probably enough. Alabi #2: My 18 year old, 8CuFt 3 way RV fridge draws about 350W on 120V power and around 280W on 12VDC. This draw is nearly 100% duty cycle (occurs most of the time) .This is a LOT of power. A residential fridge of the same size will have a low running current but a high starting one. Reading the data plate on a fridge will almost certainly provide you with an idea but they are rarely close to reality. One unit I researched as a replacement had a .75A running current (.75 x 120V = 80W) this is that eureka moment when you understand how inefficient the absorption cycle is. You can also presume the compressor will be running far less than the 100% duty cycle of the absorption. It is likely to be more like 30%. If you have a data plate with load data, it is important to understand what the loads are; “LRA” or “Lock Rotor Amperage” is the current it draws when the rotor is not moving. This is your starting load. Your inverter needs to provide at least as much as this or your fridge won’t start. It is likely 4-6x the RLA or ‘Run Load Amperage”. Unfortunately, most of this information is not going to be on the data plate. THE only way to really know is contact the manufacturer and get through to them that you’re running it on an inverter and need the data. Alternatively, get an inductive ammeter with an ‘inrush’ hold setting. I recommend a PeakMeter MS2108. Runs about $40-$50 and get the real data before you buy. Alabi #3: Get the right inverter to run a motor. Cheap inverters may say they have a high enough ‘peak’ power to start a motor but many can’t deliver it for long enough or cleanly enough to operate well. This will result in damage to the inverter, compressor or both. “Low frequency’ designs have a large transformer in them that provide power longer (multiple seconds to minutes) than ‘high-frequency’ designs (usually only less than a second). Also, get a pure sine inverter. Modified sine isn’t what any motor is designed to run on…….. If you primarily camp with hookups the residential unit is probably the preferred option today although there are still times I run my RV frig on propane with hookups if I am limited to 20 or 30 amp service and want to use the microwave or a/c. I also believe the residential unit will work for boondocking but you will need a little bigger battery bank. Even though I have an RV frig I still have 4 golf cart batteries, a 3000 watt inverter and 550 watts of solar. Most folks that boondock fairly regularly will equip their rig with similar capability based on their expected energy use. Adding the residential frig would not be a big deal. Bottom line is that either configuration can work for you. Your residential unit will give you hard ice cream but it also give you the added issue of winterizing the ice maker. Most of the residential units can be installed or removed through the RV door once the frig doors are removed. The average residential fridge consumes 80-160 battery amps a day. A cheap dealer installed battery has 40. If completely drained 80. Depends on size and outside temps. Might be much more in the south. Many customers discover dead batteries. A Refrigerators fridge is a heat pump that heats the room. Amp usage depends on outside temperatures. South Texas would make it work harder, more amps. Cheap fridges are deaper than counterdepth models. A standard, cheaper fridge will not go thru most any door. Removing a slide is very expensive. Residential fridges in a kitchen have an expected life of 5-6 years. Bouncing around on our highways will not help that. Today they are very fragile. $1000 worth of solar collectors might produce 150 amps a day. 0 in the rain or clouds. A generator would be a good idea. We love state parks with 30 amp service. Our gas electric electric water heater and fridge allows us to run two ac units plus other stuff. We also have 4 6 volt batteries. Power is never an issue. There is a 10-20% power loss in all inverters. Include that n all calculations. LG refrigerator in cardinal model 3850. Refrigerator suddenly quit working. Everything else works fine except outlet under microwave. Happened once before while we were at the FROG rally last summer. Not aware how it was fixed. any ideas? The answer to this seems obvious. Would everyone love a restaurant size walk-in refrigerator/freezer with even room for a couple of beer kegs on the side to take along with us? Sure we would. But it comes down to how would you power the thing even if you had the room? If you are the type of RVer who moves from spot to spot with your big rig, finding a campground with each stop and plugging into a pole, and from there continuously scouting out new small perimeters with your toad, then install the biggest home frig model that will fit (assuming you cook more than go out to eat). If you are instead someone who is looking for a small rig that constantly moves from spot to spot, off the beaten path and seldom parks at some “RV Ranch and Jamboree”, then ensure you have the largest propane model that will fit in your rig (if you cook more than going out to eat). In this case don’t be fooled by salesmen who try to push a home style fridge into your continuously roaming lifestyle and accept the restrictions that a 12VDC battery or 110VAC implies, which will normally require a large solar bank, large converter/charger and generator as a backup power source. If you do and your plan is to at least moderately boondock, you will likely come to regret it. In my own “free range” lifestyle, if I were shopping for a new coach I feel this is enough of an issue to buy an older model with a fridge fueled by propane instead of a new model RV, and that’s if the new model line only comes with electric powered refrigerators.. And while I likely have the power to supply one of these new 12V-only models with my own 500W solar, multi-stage, high amperage& voltage charger/converter, a generator and dual GC2 batteries – adding the additional energy consumption to my existing environment which already taxes my power source significantly makes what I have enough to manage without adding the additional burden of a 12Vdc-only refrigerator.